When I joined Prof. Yang's group, the LabVIEW software controlling the experiment lacked control of the stepper motor which provides coarse z axis control. This made it difficult to set up the fluid cell and meant that leaving the system running unattended for over an hour could place unnecessary strain on the z piezo (as it would need to compensate for thermal drift on its own). After a staring into the bowels of the MultiMode AFM and watching some of the more suspicious lines on an oscilloscope, I saw that lines 1, 2, 15, and 16 were the stepper motor drive lines and guessed that they were TTL compatible. A short while later (wink), the LabVIEW code was up and running. 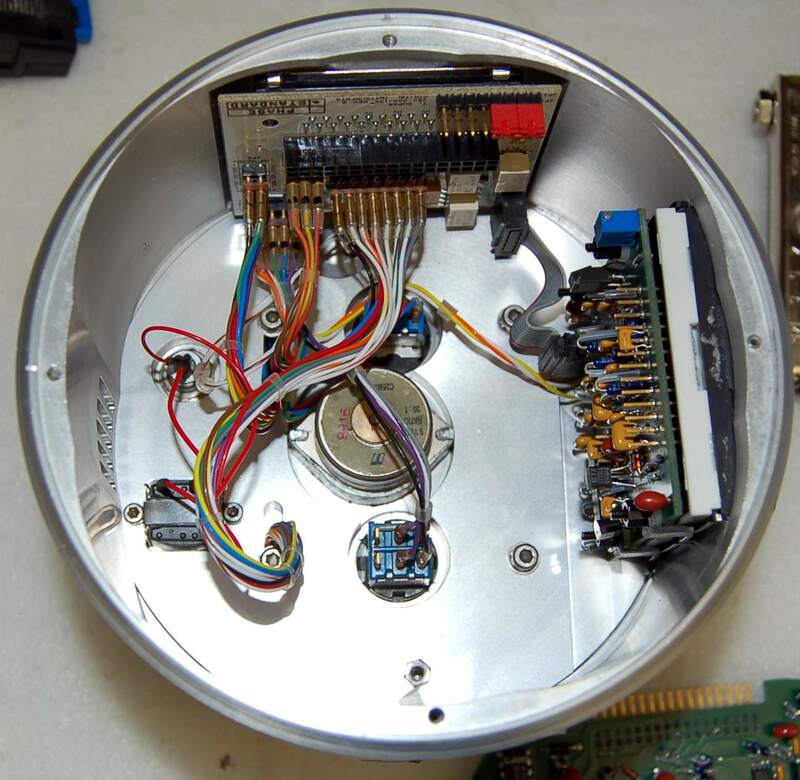 The LabVIEW computer (via a PCI-6052E card and BNC-2090 box) writes TTL stepper motor currents to the relevent lines on the Nanoscope↔MultiMode cable using our break-in box. 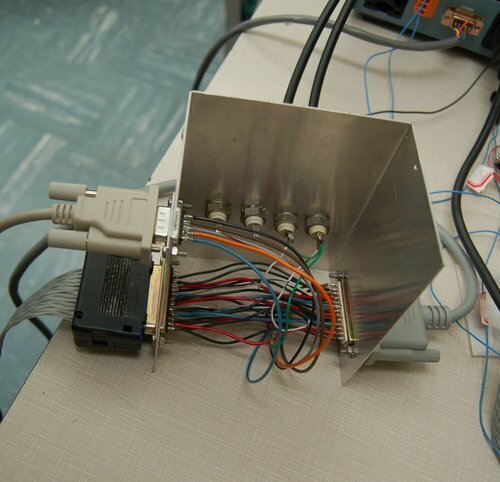 Build a DB-25 breakout box, such as the ugly hack job shown below. This gives us access to the stepper motor drive-lines. First, you need something to write to your new motor control lines. We are using the digital I/O lines from this National Instruments PCI-6052E. I've written a Python stepper module which handles the stepper logic for you. The stepper motor, like any other mechanical linkage, can have problems with backlash. Brown 20 40 Inf. Inf. Inf. Green 20 Inf. Inf. Inf. Browsing through Prof. Jones' tutorial, we see that our motor is probably unipolar with a total winding resistance of 40 Ohms on each winding. Looking closely at the stepper motor, you can see (upside down, near the right hand screw) that it is labeled 5 V DC, and 5 V over a 20 Ohm half-winding gives a current of I = V/R = 0.25 Amps. Following the motor leads back up the the main board (using the ohm-meter guess-and-check method :p), we find that they come from the DS3658N (chip 1). 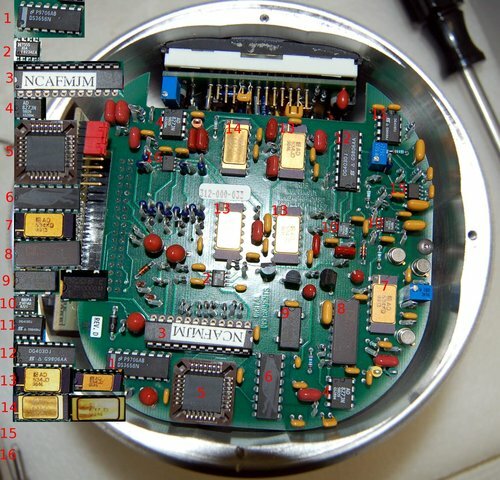 This chip takes care of all the details of sinking the large motor currents given a TTL driving pattern. WARNING! I strongly suggest you don't do this on your own. The high voltage lines for driving the piezo are potentially dangerous. The control for the DS3658N was too difficult for me to trace out on the board, so I put the main board back in the MultiMeter (leaving the base-plate off), connected the Multimeter to our NanoScope IIIa, and started clicking on the ‘raise’ and ‘lower’ tip buttons. At the same time, I watched the various DB-25 lines on the oscilloscope. DB-25 lines 1, 2, 15, and 16 oscillated, but only when the motor was turning, so I figured they must be direct TTL controls getting (somehow) to the DS3658N. I built a DB-25 breakout box to take control of those lines, and started writing software. Knowing the stepper control lines and how to control a unipolar motor, it was only a matter of matching the lines to the roles. I arrived at the matches that I pointed out in the How section through trial and error. It was fairly easy to get the motor moving macroscopically, and backlash testing convinced me that the microscopic motion is reproducible and smooth. We measured the stepper stepsize by stepping the AFM tip closer to surface and sweeping the piezo in after each step. This produced the data shown below. As the motor steps in, we record consecutive traces a, b, c, d, e, and f. Because we can calibrate the piezo by imaging a calibration sample, we can convert our piezo voltage into the distance shown on the x axis. Measuring the x distance between to traces, we see that the sample moves ~170 nm closer with each step. There is a separate post with some details on the manual stepper switch.